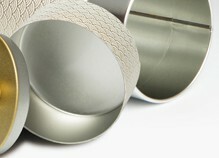 Kotodo’s canisters are made in the style of traditional Japanese tea canisters. Japan is a humid country, so the quintessential features of the canister, namely the inner lid and the deep overlap between the body and the outer lid, were developed in order to protect delicate tea leaves from moisture. This structure ensures the airtightness of the canister and its cylindrical shape prevents any moisture from accumulating in corners. (The round shape is also traditionally considered auspicious in Japan.) The canister opens with satisfying smoothness when you simply lift the lid straight up—no twisting or prying is required. While preserving these traditional features that continue to be desirable, we now use manually-operated vintage machines for some of the steps in our production process in order to achieve the level of safety not possible through manual production alone. 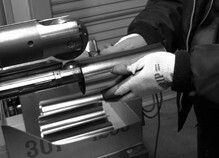 Each of our canisters, entirely made in Japan, is still mostly crafted manually and given a finishing touch by hand. The finished edges of the lid and body are flush with each other. 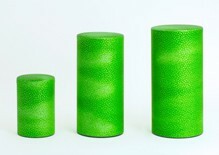 Having an even surface all around minimizes friction, thus prolonging the life of the Washi paper. The smooth surface is also aesthetically pleasing to the eye. It is a feature only for handmade. 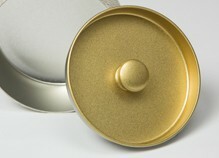 One of the unique characteristics of our tea canisters is the clicking cover. Our patterned canisters feature a lid that clicks into place where the patterns of the cover and body perfectly match. When twisting (Counterclockwise) the cover to close, it will snap into place with an audible “click” to indicate the perfect alignment of the cover and body’s patterns (some products without patterns do not have this feature). The metal inner lid will stay air tight all year around, but plastic tends to expand and contracts with temperature changes and also transfer aromas. 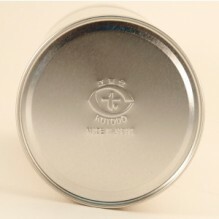 The inner lid is made of high-grade tin with a gold color finish. It protects the inside from light exposure, humidity and air. It is made by the process for which it's difficult to be damaged. The shape of its knob is easy to pull and open. Our craftsmen adjust meticulously the fit of each lid to the body of each individual canister. The skilled craftsmen try to finish the canisters to be easy to use. With user safety in mind, we take the extra precaution of beveling the cut edges of the lid and body inwards unlike most other handmade manufacturers. As an precaution, the edges of our tin-cans are rolled slightly inwards to prevent our users from injuring their fingers. All joining of a canister was leaded solder for a traditional handmade can. Today leaded solder also exists, but it is impossible to judge whether it is leaded solder or unleaded by the appearance. KOTODO stopped using solder and change it to an electric welding. Each canister is handmade by skilled craftsmen using leaded-free, food grade steel and tin in order to promise safety of 100 % and relief to customers. Our KOTODO signature is embossed on the bottom of every canister (all canisters except our Silver Tea Canister feature a black bottom). Air tight and moisture resistant, our tea canisters are perfect not only for use as tea containers, but also as kitchen storage for flour, pasta, grains, nuts and other preservable foods. Our canisters have been used to keep film away from light and air. Kotodo Canisters are perfect for storing light-sensitive items and materials. The tea canister's lid is deep and overlaps with the body, enhancing air tightness. As important as its durability, our tea canisters keep its contents safe by absorbing shock from strong force. Kotodo is concerned with the preservation of the environment. Our canisters are made using food-grade tin, and are 100% recyclable. The recycling rate for steel cans in 2016 was 93.9% in Japan. This is a very high recyclig rate! Please read the product care information carefully to maintain the quality of your handmade KOTODO product. We hope you will enjoy our canisters for years to come. ・ This product is made of tin-plated steel, and is not suitable to store liquids. Rusting may occur if the product comes into contact with water or excessive humidity, and with normal wear after prolonged use. Dry off completely if handled with wet hands. ・ Do not hand wash. Not recommended for dishwasher, microwave, or oven use. ・To clean, gently wipe the surface with a cloth tightly wrung out of water, followed by dry cloth. Make sure to dry out the surface completely. ・Rusting may occur if the product is left unattended with moisture on the surface. ・ If rusting occurs, we recommend that you stop using the product. ・ Improper use will damage the product. Please handle with care. ・Storing the canister in a refrigerator will preserve its contents even better. Please note, however, that rusting may be caused by the condensation from temperature change as you take the canister in and out of the refrigerator. ・ Please keep out of reach of children.